I am a first generation Christian. As far back as I can remember, there was always this huge red altar in my home with joss sticks, oranges and occasionally, a steamed chicken. During Chinese New Year, a whole roasted pig will be offered to the gods. Through the smoke of the burning papers and joss sticks, my family onlookers will participate in the rituals, for fortune and of course, the delicious crunch of crackling skin. Then, there was this huge gambling table, the crisp sound of shuffling a new deck of cards or the unmistakable sound of the marble tiles of mahjong colliding. And more smoke, joss- sticks and cigarettes. I came to faith when I turned 13. It is hard to imagine that such a family can become Christians but we did, with three sons serving today in the Church, no less. But it was never easy. My brother was asked to leave the home for making a decision to study in Bible school. Over the years, one by one, many of my relatives came to faith. Schooling in a multicultural environment (in Malaysia) is in itself an education. How do you live and share your life and faith with friends who are strict Muslims, Hindus or those steeped in Taoism and ancestral tradition? Christians were seen as a minority group. Strange and “peculiar” (1 Peter 2:9 KJV!) were we. Yet the Christian fellowship group grew and grew. How times have changed. In Singapore today, it feels like Christians are everywhere. My recent visit to Lat Krabang was another travel back in time and it reminded me of the environment I grew up in. 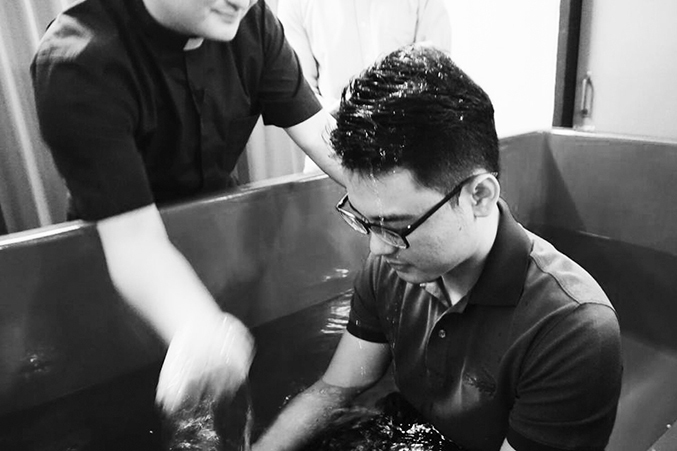 I witnessed the baptism of O’Chao (photo), whom I first met 8 years ago as a visiting student in my previous parish student exchange programme. He was clearly the leader of the pack but few of us can imagine that he can be a Christian but he is one today and a fervent one at that. Hearing his testimony and journey to faith, I am reminded again of what it takes for a person, steeped in non-Christian tradition, to come to a firm faith in Christ. Whether it is for a 3 year-old Malaysian or a Thai University student, it starts somewhere. The words of St Paul (above) were for us, something that stretched out in time. But there was a start. A word preached, a person sent and the Word grew. The Alpha Course runs this week. It can be a start for someone you know.